As promised, here is the second card featuring the amazing, new Meant to Be Bundle. The card has texture, great die cuts, and a wonderful color combination. Check below for full instructions to make this card. Start with a card base of Very Vanilla card stock cut to 5 1/2″ x 8 1/2″, scored at 4 1/4″ on the 8 1/2″ side. 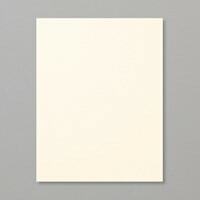 Very Vanilla is a subtle, rich color to use for card backgrounds. 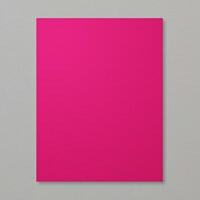 The first (bottom) layer is a 4 1/8″ x 4 1/8″ piece of Lovely Lipstick card stock. Lovely Lipstick works incredibly well with both reds and pinks! 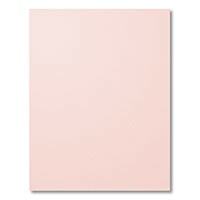 The second (top) layer is a 4″ x 4″ piece of Powder Pink card stock. 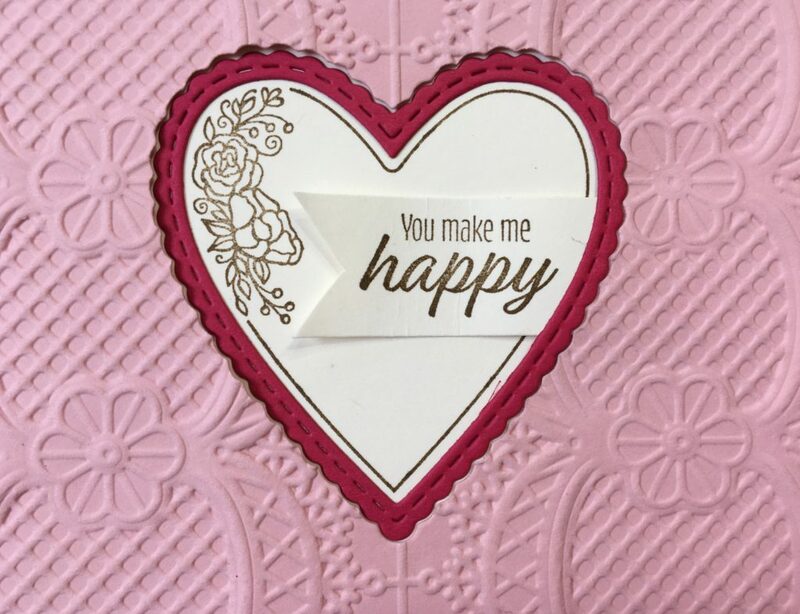 Use the heart die from the Be Mine Stitched Framelits Dies (also part of the bundle) that has a scalloped edge and a straight heart inside die to die cut a heart in the center of the Powder Pink piece. The die I’m referring to is the larger die pictured on page 7 of the Occasions catalog. 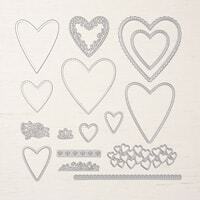 You’re going to find that it also die cuts a scalloped heart frame. Now, use the gorgeous, amazing, beautiful (yes – it really is that nice!!) 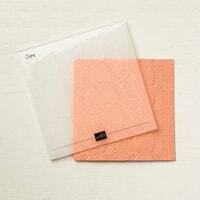 new Lace Dynamic Textured Impressions Embossing Folder to emboss the Powder Pink piece. It is very important that you die cut before you emboss. The result will be a much deeper, cleaner embossed piece. Use the same heart die to die cut the center of the Lovely Lipstick piece. You will want to save the heart frame for this card. Keep the heart die cut piece for another project. Get a scrap piece of Very Vanilla card stock (about 4″ x 4″). 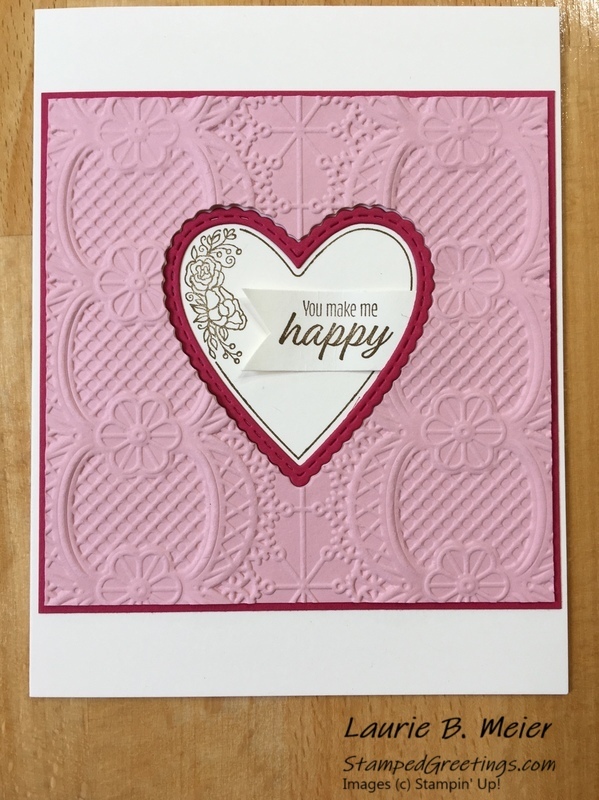 Use Soft Suede ink to stamp the heart and flower stamp from the Meant to Be stamp set onto the Very Vanilla card stock. 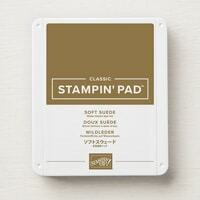 You can also stamp the “you make me happy” stamp with Soft Suede ink onto the same piece of Very Vanilla card stock. Make sure you’ll have enough card stock around the sentiment to cut a flag, as pictured. Center the Soft Suede stamped heart behind the heart opening on the Powder Pink piece. Secure with washi tape until you know the placement is correct. Also, tuck the sentiment stamped flag under the right side of the heart opening, as pictured. Next, take the Lovely Lipstick frame piece and fit it into the Power Pink piece. It will fit perfectly around the stamped heart. 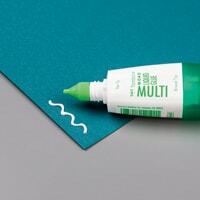 Adhere the frame piece with your favorite liquid adhesive. Now, you can better adhere the stamped heart and sentiment to the Powder Pink piece. Next, adhere the Powder Pink piece onto the Lovely Lipstick piece, as pictured. To finish the card, adhere the Lovely Lipstick piece onto the card base. As you can see, I chose to adhere the Lovely Lipstick piece in the center of the card base. The combination of textures, colors, and stamped images in this card are really a great way to send a Happy Valentine’s to someone you love. I hope you enjoy making the card. The main products I used to make the card are pictured below. If you click on any picture, you’ll go to my on-line store.